If your equipment draw includes a resource to unlock tec locks consider advancing quickly to the second floor. The locks are worth more there, possibly up to 8 DF tokens. One option for the game and leave it very exciting is you do Labyrinthian Facility described rulebook and add to the game EVERY Secret Room. This will cause many players to advance enough in the rooms only to find a Secret Room and get more DFs or more dynamic Interfaces. Obviously the area in which the card would be Secret Room would be empty in the initial setup. *Deal 2 operative cards to each player. *Shuffle the remaining items and deal 2 to each operative. *Selection phase plays per operative per player. That is to say, each of your operatives selects one card from each of their respective hands. Cards resolve in order of the first player. Each operative that player controls flips over their cards one at a time, in whichever order he/she chooses. *At the end of the game DF totals are tallied based on that player’s operatives combined total (providing of course any of their operatives escaped successfully). Next have each player choose only ONE of these cards to keep and put the other face down in the middle of the table. Once all extra cards have been added to the pool they are shuffled and added to the item deck and shuffled once more. Deal 3 cards to each operative and proceed to start the game as normal. This is a simple rule that I think really adds a lot to the game. After a good number of play throughs I noticed that not many of us were making it to the final room and those of us that went deep into the building would never get out. What we came up with is that you could escape from the last card on the second level, essentially the roof. If your group finds this too easy simply turn up the alarm dial by one at the start of the game to make it more exciting. We’ve found that this makes the game fit the theme a bit more and at the same time gives us more options and strategy to work into the game. Just keep forging onward. You’ll risk getting nailed by environment actions sometimes, but it’s usually worth it. Unless everyone is close to an exit at the end the game, you’ll likely have something that can increase the alarm anyways and trap everyone. Those trapped cut their data files in half, so you might as well forge on collect everything, and drop the hammer when the time is right. If anyone has seen the anime Ghost in the Shell’ll find yourself within the anime. For the fans of the game and the series, a recommendation is to play with the music of singer “Origa” – yes this is the same name. This is the singer’s official series and if you have not heard this Russian singer not know what you’re missing. Really gives even more excitement to the game. After playing our first game we found that all the players were on the entry tile when the dial hit 99. So we were all arrested by the security team and nobody won. We then played again obviously all trying to avoid being caught but again all of the players were caught out on the entry tile with the dial hitting 99. We then tried a third time deciding that we were all too greedy and didn’t have enough haste about leaving and 3 out of 4 of us were still caught out on the entry tile when the dial hit 99. From this we decided our house rule would be that you either have to leave the building before the dial hits 99 as normal, however if you are on the entry tile when security arrives at 99 you can roll the dice to see if you can evacuate at the last minute. On a 4,5 or 6 you succeed on a 1,2 or 3 you get get caught as per usual. This rule is only valid if you are on the entry room (first room card) and gives players a 50/50 chance of escaping the grasps of this evil corporation. 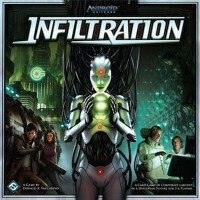 Infiltration is a “Push Your Luck” game in the vein of Incan Gold… but a much more difficult path to escape. After a few failures, you might stop venturing too far from the entrance, but that would be a MISTAKE! Why? Because, on the second floor there are two shortcuts outside… the Executive Elevator and the Blackmail card. Should you risk getting one of these? Yes! There is almost a 75% chance one of these will come up (it’s actually 73%… but that’s only a tiny matter of 2%… right?). So, the alert meter rises quicker, but you have a good chance as you venture forth to making it out before anyone else does. Don’t be a coward!!!!! Strategic Tip ~ Don’t be Afraid! Run to the Second Floor! We love to play Infiltration, but the setup time is tedious for length of the game. One way to shorten the setup time significantly is to put the DF tokens in a bag you can’t see through (cloth preferably, but it does not really matter). This eliminates the need to turn over all the DF tokens and try to mix them around before the game and between games. Just toss them in the bag and start playing. This has been a public service announcement from Granny! Some discussions of the game have included complaints about the ease of escape once the Loading Dock or Executive Elevator cards show up (assuming they do show up). At that point, players have a much easier escape route, and it seems the all the teams can escape. To make things a little more cutthroat, we added the house rule that when using the Interface function at either of these cards, you remove the Interface token. Playing this way, the Executive Elevator and the Loading Dock can only be used as escape routes by one person. This makes for more opportunities to mess with an opponent. Someone who thinks they have an easy way out may suddenly find their take away by an operative that was previously lagging behind. We’ve played with a few variants to mix up and improve the special cards you start with to give us more options in game play. We have used drafting and the prerequisites the game suggest, but I think the one that like the best is starting with one less card, at three, but when you play a card you draw a new one.